The Bermuda Rugby Football Union League season resumed at the National Sports Center with two ladies matches and two Men’s matches played. 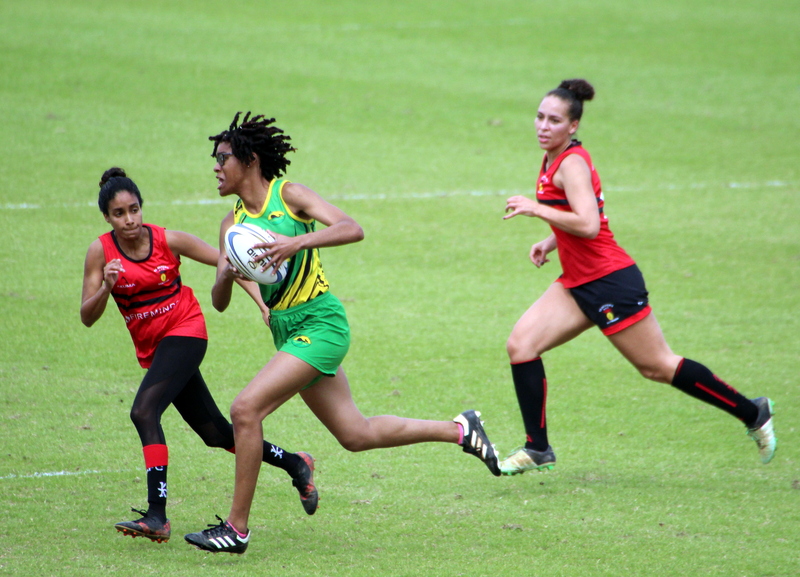 The Police defeated the Renegades 15 – 10, the Police Ladies would get Try’s from Melissa Rodriguez, Olivia Smart and Mika Tomika, while Ashley Godek and Jackie Oliver would get a Try each for the Renegades. The Mariners would then defeat the Teachers 24 – 0, the Mariners would get 2 Try’s from Apryl Jackson, while Nya Heyliger, Amanda Swan and Keisha Pitcher all added a Try each and Gina Newson added 2 Conversions. The Renegades claimed the Men’s Division Champions as they defeated the Police 52 – 7. The Renegades open the account after some good work saw Charles Craig go over for a Try, Paul Kelly kicked he Conversion for a 7 – 0 lead. Renegades were awarded a Penalty Try and with the Conversion the lead was doubled. Renegades scored their third Try of the first half after a blocked kick by Jahan Cedenio created space out wide for Alex Brown to score, Kelly converted and the Renegades had a commanding 21 -0 lead after only 20 minutes. Police responded with some good passage and a cynical interference off the ball by Peter Dunkerly resulted in a yellow card. Police took advantage of the extra man and scored a Converted Try after good pressure taking the score to 21 -7 Dan Cole converted the Try scored by Vaughn Van Oudtshoorn. Renegade secure the bonus point with a Jamie Baum Try off a turnover and when Kelly kicked the Conversion it made the score 28-7 at the half. Tempers began to fray in the second half as the level of competition heated up. The Renegades scored their fifth Try of the afternoon as Tommy Westwood went over in the corner Robin Bricknell missed the difficult conversions in windy conditions. Renegades continue to keep the pain on Police with a sixth Try by Alex Brown sprinting through the defense Robin Bricknell Converted to take the score to 40 - 7. The Renegades showed no mercy and Baum scored his second Try of the day, but Brucknel missed the difficult Conversion leaving the score at 45 -7. Baum scored his third Try of the day to make the final score 52-7. The Mariners then took on the Teachers and although they off to the perfect start with visiting player Ryan Robb scoring in the corner for an early 5 - 0 lead, the Teachers would storm back and win 49 – 10. Teachers would get on the board as George Peets kicked a well struck Penalty to make the score to 5-3. The Teachers would take the lead when Peets kicked another Penalty to make the score to 6-5. The Teachers build momentum up and Peets this time would score a Try in the corner to score extending their lead to 11-5. Teachers captain Aldo Campbell powered over from a quick tap Penalty to extend the score to 16-5, Peets kicked the Conversion to make the score 18-5 at the half. Off the restart the Teachers countered and a neat kick through by David Porter was chased down by Peets who scored a Converted Try extending the lead to 25-5. The Teachers would have Steve Wallace power through to extend the score 30-5 and with a Peets’ Conversion the score would move to 32-5. Winger Bertie Horsefield would score a Try for the Teachers in the corner and then Teachers wasted no time off the kick off with a stormy run by Campbell releasing speedster Jahkee Simons to score an unconverted Try to make it 42-5. The Mariners showed their fighting spirit with Captain Dave Rorke plowing over to make it 42-10., but the last laugh however went to Teachers who finished the scoring with Chinua Smith scoring and Simons Converted to make the final score 49-10.